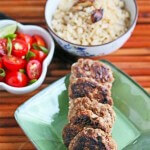 Today’s Filipino Style Turkey Garlic Sausage recipe is a healthier version of a traditional Filipino breakfast sausage. 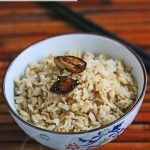 I love savory Asian and Asian-inspired breakfast foods, from congee to Nasi Goreng to Burmese Fried Rice and Peas to Asian Inspired Savory Oatmeal. 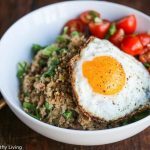 One of the first savory Asian breakfast foods I had when I was growing up was Filipino garlic fried rice and eggs at a friend’s house. 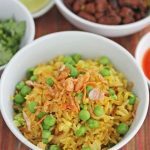 I remember being surprised when fried rice was served for breakfast – it seemed kind of odd. A number of years ago, I found Filipino longganisa sausage at our local Asian market and served it the traditional way for breakfast with garlic rice and fried eggs. Although my family loves this combination, I cringed when I read the ingredient list on the longganisa sausage package and saw all the preservatives listed among the ingredients. 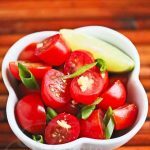 As I’ve tried to eliminate foods with chemicals over the past several years, preserved and cured meats have been near eliminated from our pantry. So, when I came across a recipe for Filipino Garlic Sausage Patties in The Adobo Road Cookbook by Marvin Gapultos, I knew I had to try making my own sausage at home. 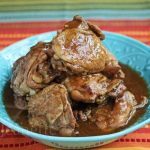 To keep things leaner and cleaner, I used ground antibiotic-free turkey instead of pork, and coconut palm sugar instead of brown sugar. In addition to smoked Spanish paprika, I also used some California paprika. These little patties are tangy and hit the spot. 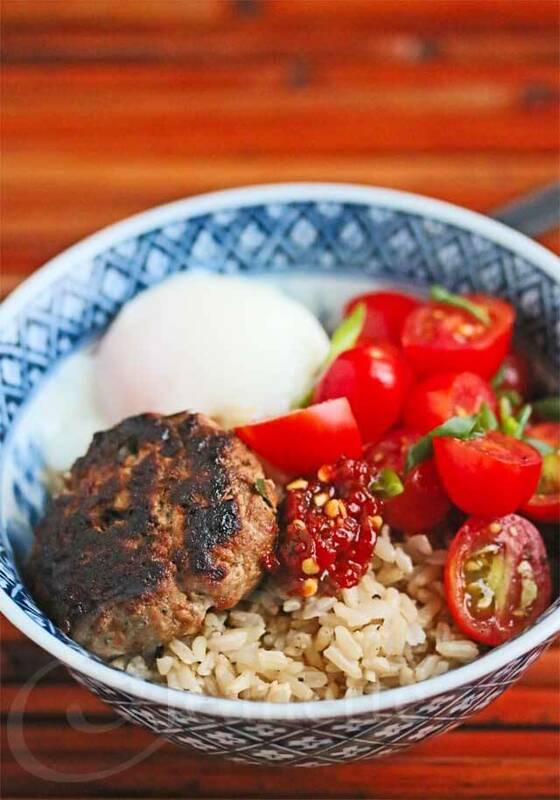 They don’t taste quite like the ones you buy in the Asian markets, but my kids and I thoroughly enjoyed a hearty breakfast with one of these Filipino Style Turkey Garlic Sausage patties served with Garlic Fried Rice, Tomato Ginger Lime Salad, and a Sous Vide Egg (you can used poached eggs). All that was needed was a dollop of hot chili sauce. Mix together all ingredients except olive oil. Cover and refrigerate overnight for flavors to blend. Form meat into 2" patties. Heat oil in large skillet over medium heat. Cook sausage patties until done, about 4 minutes per side. Thanks Serena – so glad to be back – I’ve missed being part of this community :). Thanks Cami – these are great for a hearty breakfast! I’ve never tried Filipino sausage before, but these turkey patties look delicious! Love the addition of coconut palm sugar ;). Thank you for sharing! Thanks Min – hope you enjoy these! These little patties must be very flavourful, Jeanette. I like to make meat patties for my husband, but never saw a recipe mixing them with apple cider. Have to give it a try next time. Angie- these are great, especially with some hot chili sauce. The apple cider vinegar definitely adds some tang to these little patties. Hope your husband enjoys these. Have a great rest of the weekend! I just discover your blog, I really like it. Thoses sausages is a very original way to accomodate turkey. Thanks Chantal – so glad you’re here! I love using ground turkey in place of pork in recipes. Yay! 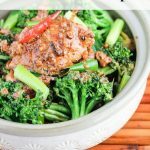 So glad you’re in the Recipe ReDux! 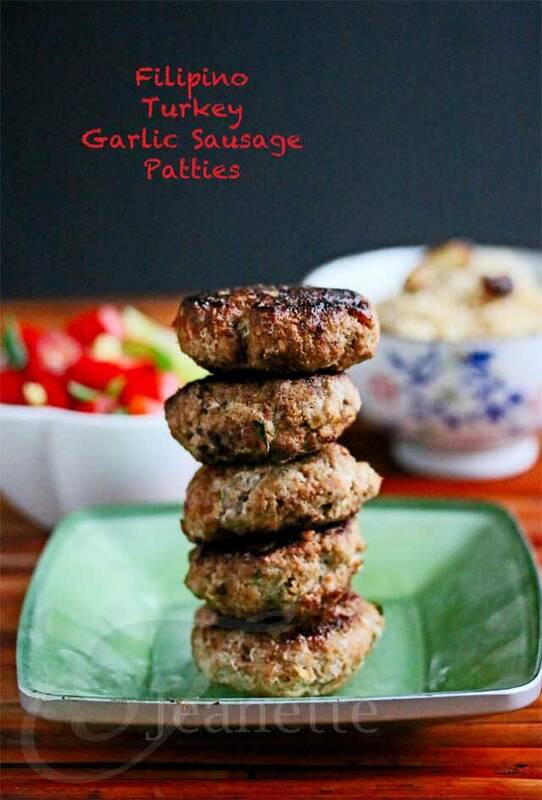 These sausage patties look delicious, and I love the combo of savory, spicy, and a hint of sweet! They look amazing in that bowl with rice, tomato salad and eggs-yum! 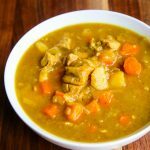 Hi EA – looking forward to hanging out with you and everyone else on Recipe ReDux – always so inspiring to see what everyone makes! The bowl is delicious! 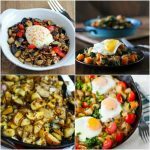 Thanks Deanna – I love trying all different kinds of food, especially breakfast foods that are different from what I’m used to. I agree – smoked paprika is great on just about anything! These patties sound so good Jeanette and now I want this cookbook! oh, i am so happy to see you on this list, jeanette! this dish looks amazing… such a hearty and delicious start to the day! i wish i had a bowl in front of me right now. 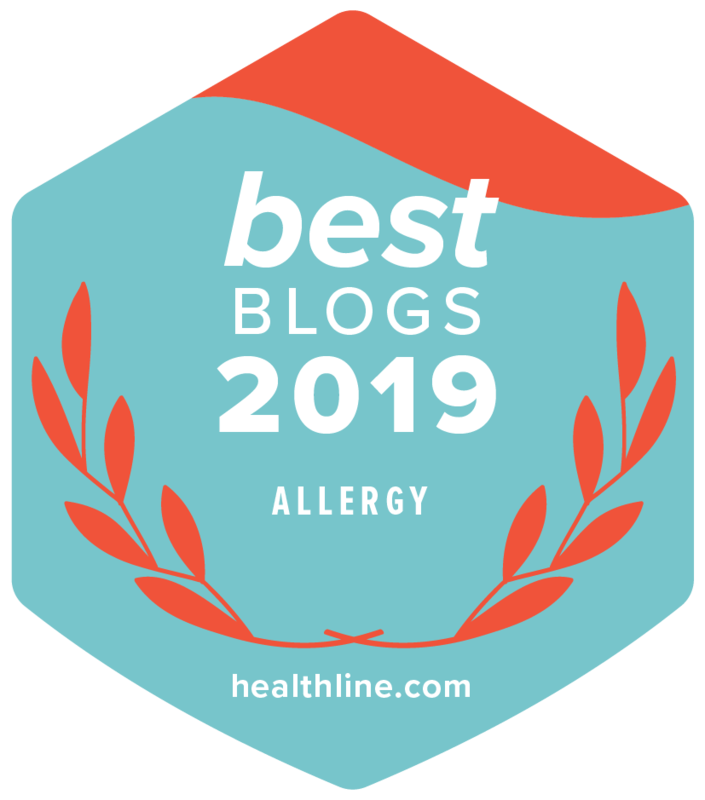 Hi Gretchen – I’m thrilled to be part of this group – so much healthy inspiration! 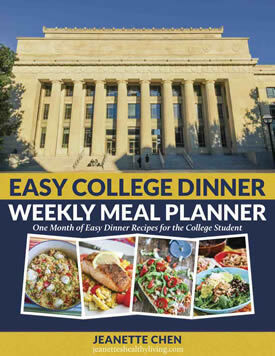 I’m looking forward to checking out more of the recipes! Thanks Liz – so fun seeing all the different patties everyone made for Recipe Redux! We had to give up nearly all sausage when we started eliminating things (like preservatives and MSG) from our diet, so I am always game for homemade recipes. This looks amazing, and I can’t wait to try it. Shaina – I hear you on all the preservatives in sausage. I haven’t made much homemade sausage, but my kids loved these, so I’m sure I’ll be making them again soon. I’ve never tried Filipino sausages but these turkey patties look amazing and sound so much better for you. 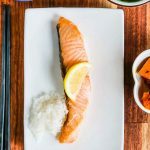 I love the apple cider vinegar in here with all the other spices – sounds delicious! I whipped these up in no time and let the mixture sit for the night. All five of us thought the flavor was unique and very delicious. 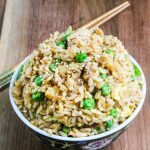 I served with rice, seaweed and pears that were very sweet. I have to admit, mine were on the dry side because I tend to cook meat too long. However, we still enjoyed them and next time I will not overcook! Lena, thanks for trying this and letting me know how it came out. Love how you served it with rice, seaweed and pears. I use the ground turkey that’s 93% lean, not 99% so there is some fat in which helps the meat from drying out. Any substitutions for apple cider vinegar. I can’t have apples. Gwen – you could use another type of vinegar that is on the milder side – maybe red wine vinegar or rice vinegar.